J.Oh! N: Chinese New Year Trip!!!!! Well, is really too quick for celebrate Chinese New Year. This year is the very first time i didn't go temple due to the rushing schedule planned by my uncle everyone need to back to hometown during cny eve. So we reach there almost afternoon time and the worst thing happen during night time which no electricity when we half way gambling in house. Next day morning we all rush again to genting. 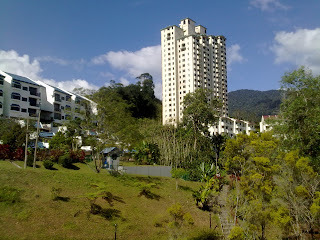 This time we not rent genting hotel but those house near Gohtong Jaya. 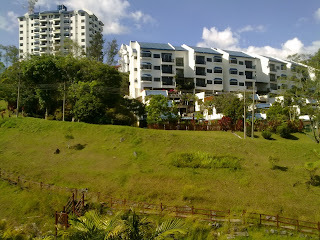 This place is Genting View Resort which lot of apartments and houses. Near Gohtong Jaya and consider as a average temperature place, not so cool and not too hot. This two pictures is taken from the house my uncle rented and all the houses is actually in a different area of genting view resort. 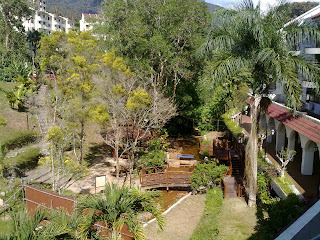 My area is River View Resort. So this is those houses beside my house and the place really comfortable and lots of trees around you. What a good place that make me want to buy one? Haha but this trip make me almost crazy and tire because after this i just left one day for rest and thursday i gonna have another trip with my friends at penang. Now i feel my semester break finally fill with active, joy and crazy after wasting two weeks sitting at home like mummy. Well i think stop right here and update my new trip info next week when i come back.